Botanical "discovery" was one of the key goals of the Lewis and Clark Corps of Discovery. President Jefferson directed Lewis to "note the food plants of the Indians" and the "dates at which particular plants put forth flowers and leaves," as well as to gather all relevant plant information that could be useful to agriculture, medicine, gardening, and scientific study. Lewis and Clark encountered a variety of American Indian cultures on their expedition. This unit focuses on the collecting and preserving of plants by Lewis and Clark and American Indians (particularly the Nez Perce) for students to consider that the way people interact with plants offers insight into what they value in life. It helps students explore how Lewis and Clark and American Indians collected and preserved plants for practical purposes as well as to teach others about the plant world. Students will collect, label, dry, press, and mount a plant specimen; create descriptive plant journal entries; and draw conclusions from primary and secondary sources. Similarly, students will learn how the Nez Perce collected, prepared, and preserved plants and passed on that knowledge to their children. 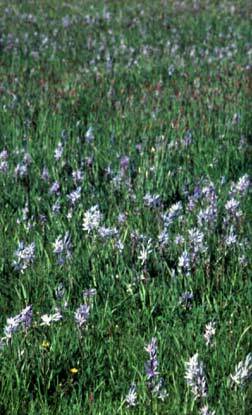 One lesson focuses on the camas root, a significant plant to both Lewis and Clark and the Nez Perce people. Students will gather and classify information from oral testimonies, specimen pages, newspaper articles, Lewis and Clark journal entries, and American Indian web sites to determine the ways in which Lewis and Clark and American Indians collected and preserved plants and their importance. Students will also have an opportunity to apply their knowledge of plants by researching ways in which plants are used by their own families. Finally, using quotes from oral testimonies and current newspaper articles, students will have the opportunity to learn how the Nez Perce are struggling to preserve their sacred fields and traditional plants along the Lewis and Clark Trail today. Many of these plants are those that Lewis and Clark chose to send back to President Jefferson as plant specimens. The culminating event will give students the opportunity to show their understanding of the ways in which two cultures pass on knowledge of the plant world through collecting, using and preserving plants. The culminating performance synthesizes the knowledge that the students gained through the unit to create a Children's Resource Book. The project is two-pronged in that students will both contribute pages on ways in which Nez Perce elders taught the younger generation about the camas root and submit a section on ways in which Lewis and Clark presented the root to their culture. After completing this project, students will be able to demonstrate the complexity of plant knowledge one can convey through written documentation and oral tradition and how this is tied to a larger worldview. Lesson 5 offers an optional class research project that can be completed over several days. Our worldview of nature dictates how we interact with plants and shape our environment. All living things, including humans, depend on plants for their survival, yet beliefs about plants vary with culture. how are the ways people collect, use, and preserve plants connected to their culture? how do the ways people share knowledge about plants express various cultural values? how do written descriptions and oral traditions that convey knowledge about the plant world give us insight into the values people live by? explain key issues that threaten the natural environment today through written and oral presentations while identifying the ways in which the Nez Perce are educating themselves and others about the threat to their plant world and access to their sacred field. Students will create charts, posters, and journal entries that reflect their ability to describe plants, summarize information, and identify key ideas. Students will complete journal assignments that require them to reflect upon and summarize what they are learning. Students will create journal entries, a specimen page, and a plant data record to indicate their mastery of scientific documentation of a plant specimen. Students will have opportunities to orally express their knowledge and to share what they know with one another in structured class activities. Students will analyze and synthesize information from oral testimonies of American Indians.